Dr. Laura M. Perez was born and raised in Floral Park, on Long Island, NY, in the shadows of Belmont Racetrack. She obtained her B.S. from Barry University in Miami Shores, FL. Prior to and during breaks from vet school, she split her time between the local small animal hospital and riding along with the late great equine practitioner, Dr. William Reed, on the backstretch of Belmont and Aqueduct racetracks. While becoming a veterinarian had always been her goal, she developed a strong interest in athletic training and physical therapy while at Barry University where she was a member of the nationally ranked women’s soccer team. Laura graduated from Cornell University’s College of Veterinary Medicine in 2003. After graduation, she completed a one year internship at Genesee Valley Equine Clinic in Scottsville, NY, and then stayed on for another year as an associate. She then worked at an equine ambulatory clinic in central New Jersey that focused on performance/sport and pleasure horse medicine. During this time, Laura started to pursue her interest in complementary medicine and became a Certified Veterinary Acupuncturist (CVA) through the International Veterinary Acupuncture Society. 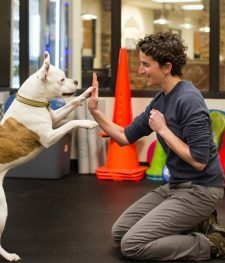 When the opportunity presented itself in 2010, Laura took advantage and completed the Canine Rehabilitation Institute’s program to become a Certified Canine Rehabilitation Therapist (CCRT). A lifelong athlete, Laura personally knows the benefits of physical therapy having undergone multiple orthopedic surgeries and subsequent physical therapy as a result of sports related injuries. She is excited to be able to put all of her interests together.